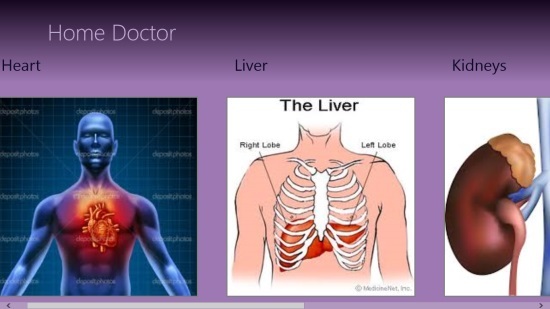 Home Doctor is a free Windows 8 health app that talks about various popular diseases related to vital organs of our body, their causes, and symptoms. This information is very important since many of us often suffer from these diseases. However, very few of us have an idea of the serious implications of not treating them on time. This happens because of the lack of awareness and proper knowledge about these very common yet deadly diseases. 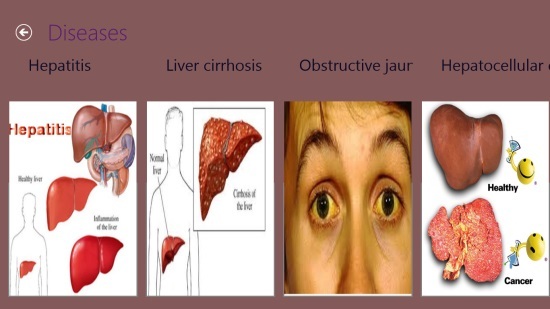 The app is broadly categorised into four parts: Heart, Liver, Kidneys, and Eyes. Each category contains information about some popular diseases, in the form of text as well as pictures of the concerned body part. Using this free Windows 8 health app, you can easily identify the causes and symptoms of these diseases well in time and obtain medical help. Home Doctor is freely available in Health & Fitness category of Windows Store. You can also view the app directly in Windows Store using the link given at the end. Let’s have a detailed look at how you can access information from this app. As you install and launch this app on your Windows 8 system, it will take you to the Start screen of the app. The various categories that the app contains are displayed as picture tiles on the main screen. Tap on any of the tiles to view the information of diseases contained in it. Each section displays information about four common but deadly diseases. 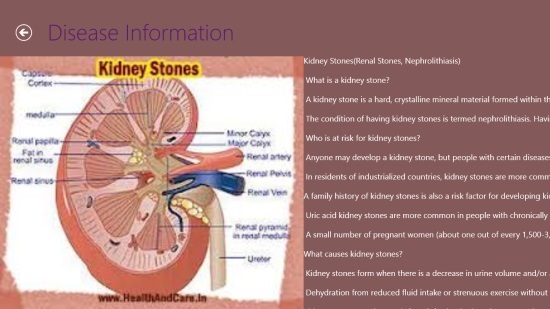 As you click on a tile under a specific category, it will open up with a picture on the left and relevant information as text on the right side. Use horizontal scroll bar to view the full information. Also check Active Fitness, EatSmart, and Yoga. Home Doctor is a nice Windows 8 free health app. It provides very useful information about diseases which many of us usually suffer with. By getting knowledge of the causes, symptoms, and risk factors of these diseases, we can ensure timely medical intervention. However, the text information given in pictures is kind of blur and difficult to read. But, you must give it a try. Do share your feedback via comments.